Don't laugh this little gem only cost $19. It brews one cup of coffee, simply, efficiently and you may choose how much coffee to use and your own brand and you have the same benefit of only 1 cup. One of the selling points of pods is the no mess pod, sorry to tell you but when you are done brewing your coffee you still have a soggy little pouch to deal with. With my one cup black and decker I insert a #1 filter or in a pinch cut down a larger one and still have the little pouch to dispose of. I avoid the cost and limitations of pods and find the coffee equal to or better than the pod makers. As a point of reference i have owned several different pod machines, for some reason I am attracted to coffee makers, an odd sort of obsession but never the less true. I have owned a K-cup and Tassimo disk machine as well. The problem with all of those machines is they are loud as they pump under pressure the hot water thru the machines. The hype and theory is that you obtain a superior cup of coffee with the hot pressure, but I did not find the taste of coffee superior. My family cannot believe that I have settled on the Black and Decker brew and go after all the money I have spent on the latest technological coffee machines, but I have. I guess if you are a coffee snob or want to display to your friends that you have reached the 21st Century a Pod, K-Cup or Disk machine is for you. Me for my single cup maker I have settled on a ugly looking small machine that makes a very good cup of coffee, with little muss or fuss at a reasonable price. Alas I do continue to look at what is out there and saw a high tech stainless steel, slim looking pod machine from the UK soon to be available in the US. It sells for $180 and if my wife does not have me committed to some mental institution that may be my next purchase. By the way our family coffee machine is a Braun with an integrated and replaceable water filter that has graced our kitchen for over 2 years. Although not a habitual coffee drinker until the past few months, I've been a coffee lover since my early twenties (I'm 37). I've always loved trying coffees from all over the world (Ethiopia, Indonesia, Kenya, Malawi, Colombia...). My current favourite is mid-dark Kenya AA. Since August 2009, I've been using a Bodum (french press) to get my daily cafeine fix. I wanted to try something different recently so I purchased a B & D Brew N' Go. Why? 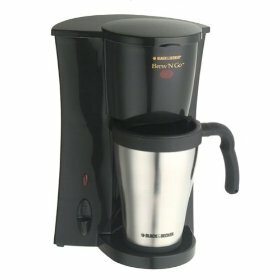 Because I wanted an inexpensive filter drip system ($19.99 here in Canada), which made no more than 2 cups at a time (about 15 oz. total), while allowing me to select my own coffee beans. All in all, a pretty satisfying little machine if you like filter coffee.